Edge Hill University sports students working with pupils at Lansbury Bridge School, St Helens. 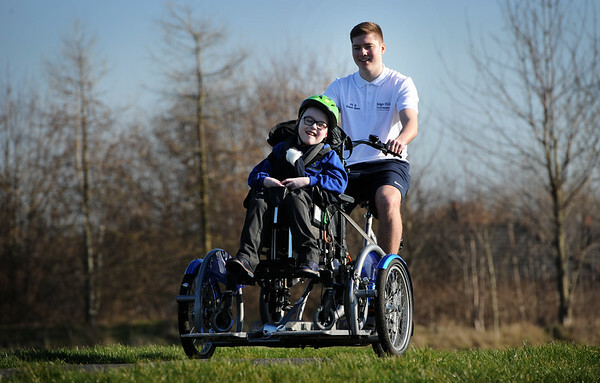 Lansbury Bridge pupil Jack Mordecai aged 10 on a specially adapted bike with student Chris Boyes. Picture by Paul Heyes, Friday February 15, 2019. PE and School Sport students from Edge Hill University taught children the joys of living an active healthy, lifestyle during a special Health and Wellbeing Week. Students studying a BA(Hons) Physical Education and School Sport degree spent a week with special educational needs pupils at Lansbury Bridge School in St Helens. The voluntary experience gives students the chance to enhance their personal and professional development, giving them confidence and an edge when competing for PGCE/School Direct places. Students led different sessions including teaching the bones of the human body and the importance of exercise and healthy eating. Student Callum Bather, 20, said: “This was a new teaching experience for us all. On the first day we wanted to find out the pupils’ strengths and weaknesses as a group and individuals then we structured the rest of the week around them. “We looked at the importance of healthy eating and asked them to design their own fruit smoothie (choice of flavour and bottle design) which they pitched to the rest of the class. “We then made some of the best ideas and some of the pupils had never tried some of the fruits before. We had some amazing feedback and the pupils loved it so much that some went home and made smoothies with their families. “We looked at the bones of a skeleton and took PE lessons where we played basketball and showed them parkour. One pupil said this was the best lesson he’d ever had. Student Reece Foster, said: “It was a fantastic opportunity to plan and organise lessons for children with different needs. It was really rewarding to see the pupils grow in confidence. Warren Brooks, Headteacher at Lansbury Bridge, said: “The week was undoubtedly a positive experience for both our learners and the students of Edge Hill. “As a school we are constantly striving to promote a healthy lifestyle amongst our youngsters, whilst ensuring they get a range of opportunities to participate in, both through the curriculum and enrichment. “The Edge Hill students fully embraced the school’s ethos and immersed themselves in delivering fun, engaging and informative activities.